William Shakespeare died 400 years on 23 April 1616. 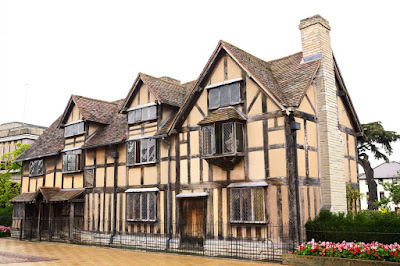 To mark this anniversary year, his home town, Stratford-upon-Avon in Warwickshire, is celebrating the world’s greatest playwright and England’s national poet with performances and exhibitions at the Royal Shakespeare Company, tours of his birthplace and commemorative events at his grave in Holy Trinity Church. Visitors can see Shakespeare’s birthplace, his school, the cottage where his wife grew up and his grave in the parish church. The one place they cannot see is the New House, the house he bought in 1597 and where he died on 23 April 1616. Shakespeare’s house was demolished 300 years ago, and the house that replaced it was flattened in 1759 by the Revd Francis Gastrell in a row over taxes. Gastrell had already chopped down the mulberry tree under which Shakespeare sat and worked, saying he was irritated by visitors peering into his garden. A five-year archaeology project means the whole site is being redisplayed for the anniversary and the garden has been restored. 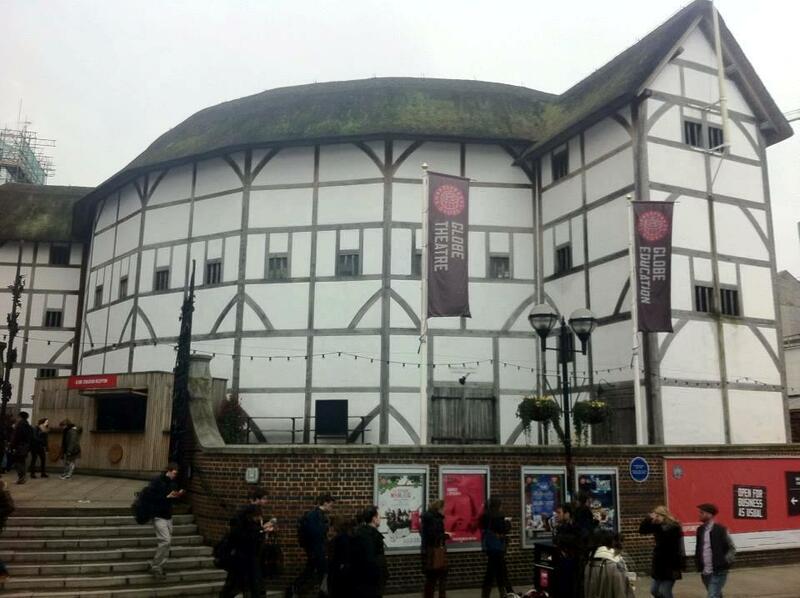 Shakespeare’s Globe Theatre in London is completing its first world tour, in which Hamlet has been brought to almost every country. The production arrives back in London in time for the anniversary weekend of 23-24 April, along with a 37-screen pop-up cinema, one screen to showcase each of Shakespeare’s plays, along the South Bank. Shakespeare is widely regarded as the greatest writer in the English language, and his use of language helped shape modern English. His surviving works include 38 plays and 154 sonnets. His plays have been translated into every major language and are performed more often than those of any other playwright. 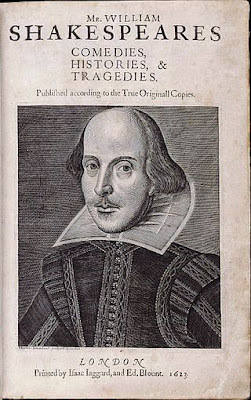 Yet his plays might not have survived if friends and actors had not collected every scrap of every play they could find and published the First Folio in 1623, seven years after his death. There is little documentary evidence for his life and times, and we have few records of his private life. This vacuum has stimulated considerable questions about his physical appearance, sexuality, and religious beliefs, and whether he was the author of the works attributed to him. Shakespeare’s work displays accurate knowledge of the law, politics, history, geography and politics of England, Italy and France, yet there is no evidence that he ever travelled further than London. Some scholars suggest the Shakespeare of Stratford did not write the sonnets and plays. Their alternative suggestions include Francis Bacon, Christopher Marlowe and Edward de Vere, Earl of Oxford. But few academics now question the traditional attribution. William Shakespeare may have been born on Saint George’s Day, 23 April 1564, and he was baptised on 26 April 1564. When he was 18, he married Anne Hathaway, and they had three children. Between 1585 and 1592, he began his career in London as an actor, writer, and part-owner of a playing company. He produced most of his work between 1589 and 1613. He appears to have retired to Stratford around 1613 at the age of 49, and died there three years later. By the 18th century, Shakespeare had lost his popularity and his plays were seldom staged, even in Stratford-upon-Avon. 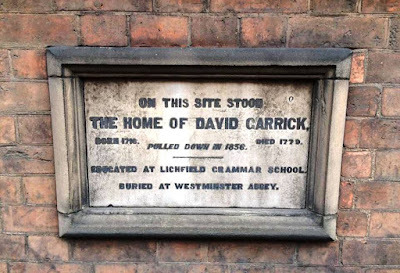 Samuel Johnson’s friend and former pupil, the actor David Garrick, was singularly responsible for reviving his plays on the English stage and defined the way Richard III has been played ever since. In his Dictionary, Dr Johnson quotes Shakespeare more often than any other author, and expressions such as “with bated breath” (Merchant of Venice) and “a foregone conclusion” (Othello) have found their way into everyday English speech. A series of scholarly editions of his works, beginning with Samuel Johnson’s in 1765, revived his reputation, and by 1800 he was firmly enshrined as the English national poet. The Dublin Shakespeare Society (or ‘Shakes’), founded in 1907, is the oldest non-professional theatre company in Ireland. 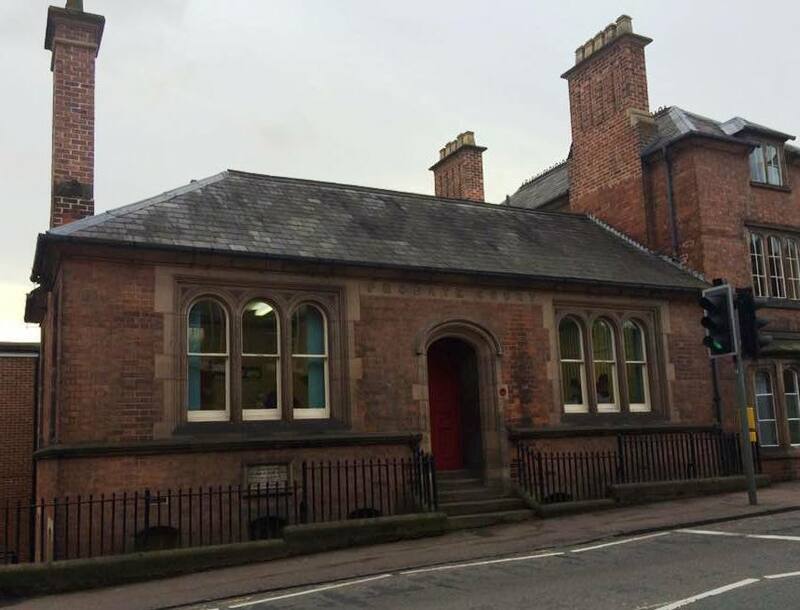 Their first production was Romeo and Juliet at the Molesworth Hall in April 1910, and since then the Shakes have staged some of the best Shakespeare productions in Dublin. The inaugural meeting was held in the Theatre Royal, Dublin. The Revd John Pentland Mahaffy, later Provost of TCD, was the first president, and he was succeeded in 1908 by Edward Dowden (1843-1913), Professor of English and a brother of John Dowden, Bishop of Edinburgh. Edward Dowden’s biographical and critical concepts of Shakespeare are played with by Stephen Dedalus in the library chapter of James Joyce’s Ulysses. For decades, a stained glass window of Shakespeare, once thought to be the work of Harry Clarke, decorated the La Scala Theatre, later the Capitol Cinema, in Prince’s Street, Dublin. The site was demolished to make way for the British Home Stores (now Penney’s). 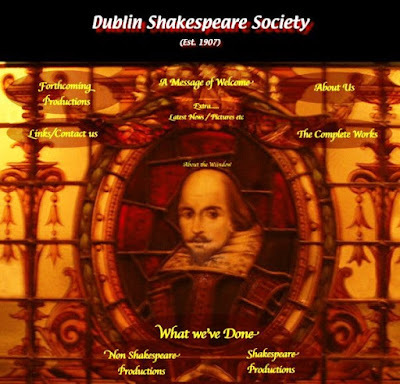 The window was saved by the Dublin Shakespeare Society and is now stored in the library in Ballyfermot. Shakespeare’s plays are often performed in crisp English accents. But experts claim the original pronunciation had echoes of Irish, New England and Cockney accents. Professor Paul Meier of the University of Kansas suggests the original audiences would have heard accents with “strong R-coloured vowels” that contrast with the polished deliveries of actors like John Gielgud and Laurence Olivier. In the early 20th century, two Irish writers, PW Joyce and Sir Dunbar Plunket Barton, claimed that English as spoken in Ireland preserved 16th century speech, and that Ireland retains the language of Shakespeare’s time. Some Irish words found in Shakespeare’s works include ‘Puck’ for a spirit in A Midsummer Night’s Dream, from the Irish Púca meaning a ghost; and there is a reference to Queen Mab as a fairy queen in Romeo and Juliet. The list of titles of John Talbot, Earl of Shrewsbury, in Henry VI Part 1 include “great Earl of Washford, Waterford and Valence,” a reference to Talbot’s two Irish titles as Earl of Wexford and Earl of Waterford. But Ireland has a shadowy presence in Shakespeare’s works, and his references to Ireland are fewer than those to Wales (think of Owen Glendower), to Scotland (think of Macbeth), or Denmark (think of Elsinore in Hamlet). However, the historian and composer William Henry Grattan Flood (1859-1928), makes some of the most curious claims for Shakespeare’s Irish links. 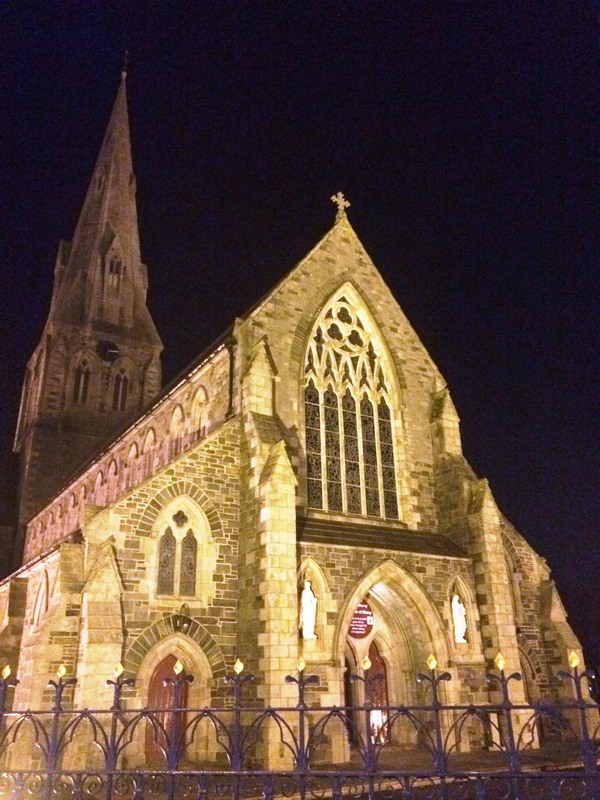 Grattan Flood was born in Lismore, Co Waterford, and was the organist of Saint Aidan’s Cathedral, Enniscorthy, Co Wexford (1895-1928). While he was living in Enniscorthy, he wrote his History of Irish Music (1905), in which he devotes a full chapter to Shakespeare’s knowledge of Irish songs, suggesting allusions to 11 Irish songs in his plays. Some legends claim Shakespeare wrote Hamlet while visiting his friend the poet and composer John Dowland at Dalkey, Co Dublin, and that his account of the shore of Elsinore is based on the shoreline at Coliemore in Dalkey. Grattan Flood claims Dowland was from Dalkey and published this theory in 1922. He claims that while Shakespeare was writing Hamlet in 1601, he asked Dowland about life in Denmark, and that Dowland compared Elsinore with Dalkey. But there is nothing to connect Dowland with Dalkey apart from the name of a John Dowlan who died there in 1577, or to link the topography of Dalkey with Elsinore. Nevertheless, there is plaque by Sarah Purser commemorating John Dowland in Sorrento Park in Dalkey, and there is a Victorian house called Elsinore on Coliemore Road. In a more extravagant claim, the Meath historian Elizabeth Hickey suggests in her book The Green Cockatrice that the author of Shakespeare’s plays was William Nugent (1550-1625), a Catholic rebel from Ross Castle, near Lough Sheelin, Co Meath, and the descendant of an old Co Westmeath family. William Nugent was brought up in England from the age of nine in the household of his guardian, Thomas Radclyffe, 3rd Earl of Sussex, a poet who was fluent in Latin and Italian and a patron of literature and drama. During his career in Ireland, Sussex had restored part of Christ Church Cathedral. He was the uncle of the poet Sir Philip Sidney, the writer of sonnets, and of two of Shakespeare's patrons, Henry Wriothesley, 3rd Earl of Southampton and Robert Radclyffe, 5th Earl of Sussex, also the patron of poets and dramatists. His widow endowed Sidney Sussex College, Cambridge in 1596, 20 years before Shakespeare’s death. Some scholars claim that members of Shakespeare’s family were recusant Roman Catholics. 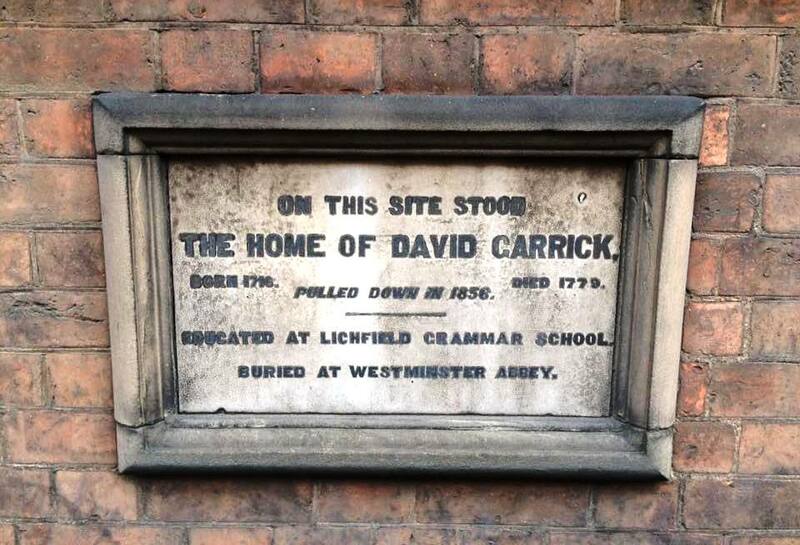 His mother Mary Arden was from a pious Catholic family. A Catholic statement of faith said to have been signed by his father, John Shakespeare, was found in the rafters of his former home in 1757, but the document is now lost and scholars question its authenticity. In 1591, John Shakespeare was reported for not going to church, and in 1606 Shakespeare’s daughter Susanna is named on a list of people who failed to attend Easter Communion in Stratford. Shakespeare was never a regular churchgoer in London, but many members of his acting company were on the parish register of Saint Saviour’s Church, now Southwark Cathedral, where Shakespeare is commemorated by a window and statue in the South Aisle. Whatever his private views, Shakespeare was baptised and confirmed member in the Church of England, he was married in church, his children were baptised, and he was buried in his parish church when he died on 23 April 1616, at the age of 52. Canon Patrick Comerford lectures in the Church of Ireland Theological Institute. This feature was first published in the ‘Church Review’ (Dublin and Glendalough) and the ‘Diocesan Magazine’ (Cashel, Ferns and Ossory) in April 2016.